Tax ID# TA-063-891-2512-01. Permit # BBPH2010/0002. 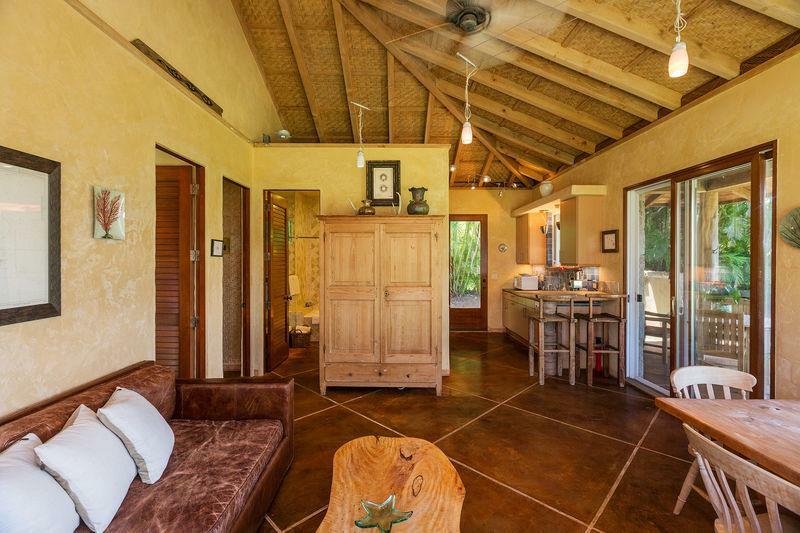 Romantic, unique, charming coral rock cottage perched on the edge of Maliko Gulch. Swing in the hammock, or play tennis on the clay court. This is a property for nature lovers, romantics, and anybody looking for a quiet escape from reality. Wake up surrounded by plants and trees, and an endless blue sky. With lodging like this, why would anybody consider staying in a condo with thousands of other tourists? The Iolani Guest cottage is fabulous for a Maui Honeymoon, quiet escape, or anybody that would enjoy a quiet Maui vacation rental cottage. The property occupies a large two acre parcel of land, in the lowest section of Haiku (out of the rain band) and just a couple of minutes from Hookipa Beach. The grounds are beautifully landscaped with hundreds of trees and plants. A clay tennis court is available for your use. Sitting to one side of the property, with its own garden and lawn, the cottage has a wonderful, tropical garden view, and looks into the edge of the gulch. There are coral rock exterior walls and a patio with teak outdoor dining furniture, gas grill and sun loungers. The interior has a custom kitchen (granite counters, top quality appliances including a sub-zero fridge), living area which opens to the deck, two bedrooms (each with king bed), and a custom, tiled bathroom. Other amenities include telephone, TV, DVD, stereo, laundry, WiFi. This is the perfect cottage if you're seeking a reasonable price, but an upscale interior. One of the best features - a unique, coral rock outdoor shower, fabulous to rinse off when you come home from the beach covered in sand. $275 per night. 30% down to hold a reservation. Balance due 75 days before check-in. $500.00 security deposit. $150.00 cleaning fee. 4% processing fee. Listed rates do not include tax. Holiday and peak season rates and required length of stay may be different than quoted above. Credit cards, cash, checks and wire transfers accepted. Minimum night stay varies amongst the various rental units. Many rentals have 30-night minimums. Permit number: BBPH2010/0002. Tax number: TA-063-891-2512-01.